Holidays have a way of dredging up old memories, for example my Swedish grandmother's method of putting a dried, crushed eggshell into her old percolator along with the coffee grounds. My grandmother's people came from the north of Sweden where nothing is wasted, but did putting eggshells in the coffee make it better? Actually, it probably did. Eggshells are made up of primarily of calcium, which readily leaches into warm, acidic liquids like coffee, which has a pH between 4 and 5. Like a low dose of lime, the eggshells probably raised the pH slightly and mellowed its flavour. They also probably enriched the coffee with dietary calcium, which Grandma Ruth would have loved had she known about it. Indeed, recent research has shown that consuming eggshell powder as a dietary supplement increases the formation of both cartilage and bone in people with osteoporosis, and can significantly strengthen bones of post-menopausal women. The calcium from eggshells is also welcome in garden soil, where it moderates soil acidity while providing nutrients for plants. Eggshells contain such an abundance of calcium that they can be used almost like lime, though you would need a lot of eggshells to make a measurable impact. By the time they are well ground, it takes 150 eggshells to make a cup of coarse eggshell powder. I should know. I make precious pulverised eggshells and use them as a dietary supplement for selected plants. Tomatoes that have a handful of eggshell meal worked into the planting site are not likely to develop blossom end rot, and plenty of soil calcium reduces tip burn in cabbage, too. I have heard ten thousand times that eggshells placed on the soil's surface deter slugs, but when I tried it the slugs just laughed. When some Oregon slug slayers set up two actual tests, they found that a ring of eggshells stimulated slug feeding rather than stopping it (see photo at right). It is a myth that eggshells deter slugs. Yet eggshells are quite useful in adding calcium to homemade fertilisers, or you can simply make calcium water by steeping dried eggshells in water for a couple of days, and then using the strained water for your plants, including houseplants. Plants that haven't been repotted for some time often perk up quickly when given a good drench of eggshell water. Eggs are known carriers of salmonella, which should not be present on uncracked eggs that have been well washed, but you never know. Unless the only place the eggshells are going is into the compost bucket, I rinse them well and let them dry in a sunny windowsill. The dryness should kill any salmonella present, but if you want to store ground eggshells that are safe for you or your dogs to eat (eggshell powder is used as a calcium supplement for dogs, too), sterilise them in a 200°F (93°C) oven for 30 minutes. You can then pulverise the dried eggshells using a mortar and pestle, or let a coffee grinder do the work for you. Stored in an airtight container, crushed eggshells will probably last forever. "I sterilise and crush my eggs and add to the chicken feed which gives them added calcium for healthy future egg production! " "I grind mine in a coffee grinder and then add it with my kitchen waste to my "worm farm" for them to give me vermicompost. I read that worms have a gizzard in their digestive system similar to that in chickens. They need a gritty element to their diet in order to gring and macerate their food. As you note it also tends to offset the coffee grounds low pH which I also feed to my worms. Makes brilliant compost!" "I freeze all of my kitchen waste, including eggshells, before putting on the compost pile. I have noticed that the frozen eggshells break up into smaller pieces. Freezing also helps break down plant and egg cells which in turn aids in composting. " "I save my eggshells to crush and put around tomatoes and other plants. I'm fascinated by the idea of consuming them myself though, as my family has a history of osteoporosis and I'm sure I could use more calcium. How would you grind them fine enough, and what would you use your eggshells in? (Our hens are organic, and I'm assuming salmonella free, since I regularly eat raw cookie dough (YUM!) and haven't gotten sick)"
"OK, Grandpa's secret for amazing plants. Secure Eggshells, Lobster Shells and Shrimp shells from local catering seafood restaurant, freeze them,blend them to a pulp using a liquid mixture of compost tea and Fish emulsion.Depending on soil needs, bone and or blood meal goes into the mix.Imagination can adjust this base recipe. Application can be as a liquid. I mix it with dry finished compost or peat-moss keeping ph in mind when creating. An unnecessary step is to place the tub of mixture in front of a blowing dehydrator to remove all moisture. The end result is a somewhat powdery mix that stores well and can be conveniently hand applied. " "Joan, the dosage I saw in the two studies above was one capsule dried powder taken twice a day. A coffee grinder should make the powder fine enough to put into capsules. I also have seen people steeping sterilized eggshells in lemon water (one tablespoon lemon juice to one quart water) for a day or so, then drinking the water. I don't see why you could not put coarsely ground eggshells in a tea ball for steeping." "Boiling water (as in using eggshells in coffee) should be more than enough to kill any germs. So it's not necessary to sterilize eggshells before using them if it's in something like that. I would imagine that powdered eggshells would be good in all sorts of cooked dishes if someone needed a calcium supplement." "I was using my coffee grinder to grind eggs shells to powder. Finding this time consuming and laborious, plus the egg powder plugged up the lid making it hard to remove, I was trying to figure out an easier way. After much research I purchased the Miracle Electric Grain and Flour Mill - ME300. This mill exceeded my expectation. I was very pleased to see that the opening to the auger was fairly large. I didn’t have to crush the egg shells down to grain size. I filled the hopper three quarters full and the machine easily milled the shells to a fine powder. It did not overheat or plug up. I am raising Red Wiggler worms for the casting to use in my garden. The most effective way for the worms to use eggs shells is to feed in powder form. Now that I have an easy way to grind eggs shells, I will also use them as a soil amendment in my garden and maybe add them to my compost. I also want to mention, I did dry the eggs shells in the over before grinding them. I put the egg shells in the oven after using the oven, and dry them from the residual heat. " "I use my old blender to pulverize my washed egg shells. The base of the blender fits a mason jar perfectly- I put the base (with blade) on my jar full of shells, screw it on, flip it and attach it to the machine. They pulverize nicely dry. I let the dust settle and then I just remove the blender part and screw the mason jar lid on and store it just like that." "I throw my eggshells into an old pie pan that i keep in my oven when my pan gets full I leave them in the oven when it preheats when baking, then I grind them to a powder and am adding them to my plants. I think I will add them to my comfrey tea as well as my coffee grounds"
"I started adding crushed eggs shells to the soil in my greenhouse borders where i grow tomatoes in 2013, and it was the first time NONE of my tomatoes got blossom end rot. Very successful indeed. " "Oh my goodness! Incredible article dude! Thank you, However I am experiencing issues with your RSS. I don't understand why I am unable to subscribe to it. Is there anyone else having identical RSS issues? Anyone who knows the solution can you kindly respond? Thanks!!" "It is recognized as a powerhouse as it can produce numerous nutrients essential to the body's normal functioning. There is not any replacement for water, so don't believe you can drink soda instead. There are really many strategies and tips around that you're guaranteed to get confused." "I have never used egg shells, except to give calcium to the chickens that laid them. I do know if you sprinkle chicken feed a foot away from the plants in a line, the slugs eat it and blow up, or are too fat to move and I feed them to the chickens." "Hi! So I planted some cilantro seeds in eggshells but I hadn't washed the shells!! Now the cilantro is growing really nicely but I'm scared it might be contaminated with salmonella!! I'm really new to all this and I was so excited to just plant the seeds that I went straight to it after cracking the eggs open. Does anyone have any insights? Thanks! " "The cilantro will outgrow the eggshells in days, maybe hours. Thoroughly dampen the roots, hold the little plant upside down between two fingers, and it should slide out of the shell for moving to a bigger container. If you leave the plant in the shell you will need to crack it, because cilantro has a taproot that wants to go straight down. Better to direct-seed cilantro where you want it to grow." "I washed my egg shells. then let them dry. then I put them in a blender till they were a powder. my question is I did not put them in oven or micro wave. will this cause a problem .Can I still put them in oven to kill germs? " "I have several ziplock bags of crushed eggshells to use in my garden but, did not know about sterilizing them or putting them into the oven. I thought they might help with slugs and deer but after reading some posts, it seems to be countER-productive. Is there som way I can still use my shells in the garden? By the way, I usually let my dogs lick the egg white out and then pull out the "inner skin" of the egg shell which they seem to like very much. Is this a bad thing for them? 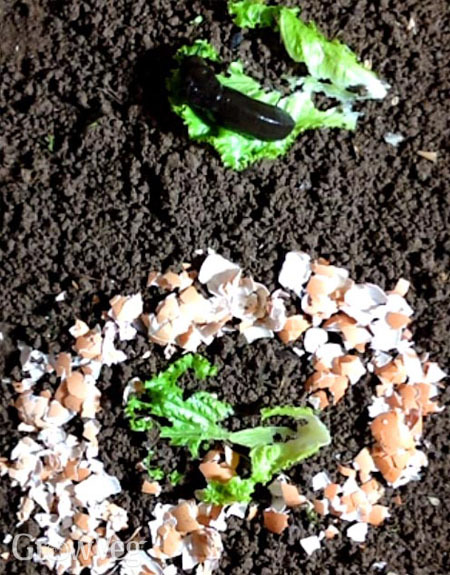 Susan 5/11/15"
"Shirley, it is more dryness than heat that kills the worst bacteria, so your eggshell powder is probably fine...Susan, just add your eggshells to you compost, or dig them right into your soil since they are already crushed. They are a rich source of soil calcium, great for tomatoes. " "How often should you put crushed powered egg shells around your tomatoes? And is it good for all other vegetable plants as well like squash egg plant and peppers? And oh yes hostas. roses dalilies etc." "How much crushed egg shells is put in the hole when planting tomatoes. " "Natural soil calcium (decomposing eggshells) is good for all plants, but tomatoes in midsummer have an increased need, so they benefit more than other veggies. One or two handfuls, or about one-quarter cup of crushed eggshells per planting hole for tomatoes or peppers, would be nice. More eggshells crushed onto the soil's surface would not hurt. " "I did not add egg shells in the planting hole I just spread it around the plants and worked into the soil. Is that OK?" "Eggshells on the surface naturally leach their calcium, so it's a good place to put them." "I am experiencing some small holes and spots on my egg plants. Does anyone have a solution for this problem?" "Perry, that is most likely flea beetles. You will need to cover plants with tulle or row cover to limit the damage." "I live in France and here everyone claims they avoid blight in tomatoes by putting a cover over the stakes they tie them with and spraying with a fermented mixture of plants like stinging nettles, horsetail, chamolille etc. 200g of dries plant for 10 liters of water fermented for 2-3 weeks (when it makes no bubbles it is ready) diluted 1:10 when watering and about the same for spraying the leaves. another advice I got was companion planting with medicinal plants and marigold. So far no blight but I do pick all the leaves with spots on them and throw them in the garbage bin. Hope it helps!" "Lexy I guess we all learn something new every year. And growing vegetable plants presents a new challenges each season.Thanks for your tip." "Ive only just started saving egg shell's so you have provided me with a great read, thank you for that, I have a food garden and also my own chickens so will definately utilise the information in this article." "Hi. I read that the calcium in egg shells isn't readily available on solid form, needing mixing with vinegar to react and release the Ca. Is this true?" "Mike, several studies using eggshell powder as a calcium supplement have showed that bioavailability of the calcium in eggshells is as good as with dairy products, with far fewer contaminants compared to other natural calcium sources. " "You said it yourself, "crushed eggshells will probably last forever." Egg shells do not add nutrients to the soil. They do not decompose unless soil is extremely acidic and other conditions are exactly right. They simply break down into smaller bits that are still too big for plants to use. Snails and slugs will crawl right over eggshells. Check the science. "